Sometimes as young as twelve, Midshipmen were the nursery from which officers eventually evolved. Nominally in charge of mature hard bitten warrant officers and crewmen, it is easy to understand that those who made the grade made became outstanding Captains and Admirals. 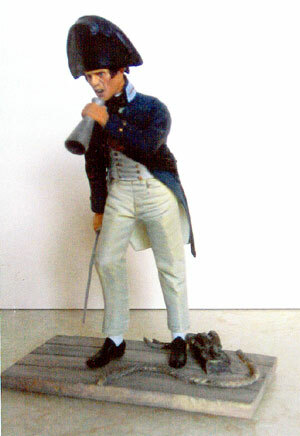 Our model depicts a young midshipman, with his speaking trumpet to overcome the noise of battle, working to coordinate the activities of gun crews.